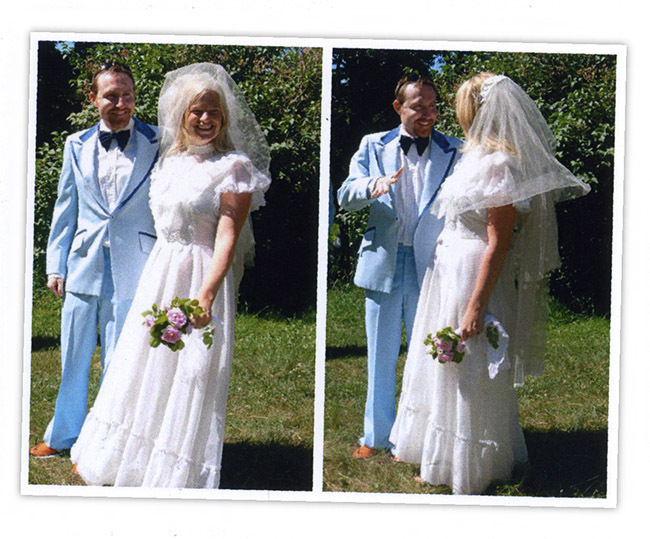 Yesterday was my second wedding anniversary, which brought back lots and lots of memories of this day. The day before yesterday was the second anniversary of the day that TC and I eloped. On bikes. With friends who thought they were showing up for a pancake breakfast followed by a group bike ride to a nearby lake. Who we forced to dress up in powder blue tuxedos and mint green bridesmaids dresses. At 10 am. Here is what happened. My dear friend Chris was scheduled to marry us on Saturday. On Wednesday he called me to say that he had just learned that he was not, contrary to what we all believed, legally able to marry us in Vermont. This problem seemed sort of minor compared to the issues I was dealing with on that day, being A) the recent and surprise delivery of forty metal voting boxes that had been irrevocably installed in the once spare and lovely town hall that we planned to marry in, and B) the fact that I had just spoken to my DJ on the phone and found that he was both a "monster fan" of techno and, by the sound of it, thirteen. "You are going to have to find someone to legally marry you, preferably before Saturdays ceremony." Chris told me. This, as it turned out, was my easiest problem of the day. Luckily, a real life Justice of The Peace, a wonderful lady by the name of Diane Mott, lives next door to the Blueberry Hill Inn. She and I had met a few months earlier. I hung up the phone and walked forty paces down the dirt road to her place, a simple little farmhouse dwarfed by wild rosebushes, and knocked on her door. I explained the problem to her and told her that TC and I had planned an activity for friends who were coming from out of town on Friday morning, a "Bride Ride", and had rented a bunch of bikes and would be cycling right past her yard. I asked if we could stop and tie the knot on our way to Silver Lake, thinking that we would do so in our bike shorts and then be on our merry way. I did not imagine it being anything more than a legality, really. She loved the idea, and loved the fact that it was surprise. I had said goodbye and was walking back down the driveway congratulating myself on having proved my bridesmaids wrong with such simple, sane, problem solving / wedding planning when I saw the big red barn, its wagon-width doors partway open. I turned back to look at Diane, who was still on her front porch. "What do you keep in there?" I asked, pointing at what looked like a dozen or so full skirts and petticoats poking out from under a dusty tarp. "Oh, I store and manage all of the costumes for every theater company in the state." I called TC, who was still in New York, and ran my new plan past him. We agreed that unless we wanted to plan a second wedding (which we really, really, didn't) that we would stick to just one rule. We would invite everyone who planned to be in town by Friday morning on the bike ride but not tell any of them what was actually going to happen. Whoever showed up... showed up. We would get everyone dressed up and get married on the front lawn. TC and his groomsmen (every man who showed up for the ride, actually) dressed in powder blue polyester tuxedos with white ruffled shirts. My girls wore floor length mint green gowns with big gauzy mutton sleeves. They got to pick their own hats. I found the exact dress - gunne sax, of course -that I would have chosen for my wedding gown had I gotten married in the eighth grade, and somehow it fit me more perfectly than the custom gown I would wear the following day. We all dressed in the big musty cavernous barn, the girls on one end and the guys on the other. I asked my good friend Tim, TC's brother and the person responsible for getting us together in the first place, to meet me at the barn door and walk me down the aisle. TC's father wore a big rainbow wig, his mother wore a very stunned look on her face and a hat that screamed Hello Dolly. My dear, dear friend Mike played his tiny tiny guitar beautifully with his brand new baby strapped to his chest. The other infant at the party wore a giant tutu, and I was planning to carry her down the aisle for lack of a bouquet until Diane appeared with a seriously stunning bunch of roses, cut from the hedges in front of her little house just minutes before. They were perhaps the prettiest bunch of flowers I had ever seen. This was the first moment that what had so far seemed to be an impromptu costume party to being... wait for it... my wedding. Diane started to cry during the ceremony. She was great. Afterwards we passed around red plastic keg cups filled partway with champagne. It was almost perfect, and had taken literally ten minutes to plan. Thats not to say it wasn't lacking in a few spots. TCs sister and oldest brother (his best man) weren't there, nor was virtually anyone from my family other than my sister. There was no food, unless you count the five chocolate chip cookies that Kristy ran back to the kitchen for before we got back on our bikes. I can't say that it was a completely stress-free wedding, because we were right there on the side of the road in full dress and I was seriously worried that a wedding guest - my mother, to be specific - would drive by in the middle of the event. I imagined her coming to a screaming halt and putting her car in reverse, then staring at us from the window of her car. "Heather?" she would have said "What the **** is going ON? You said SATURDAY!" So, as wedding season approaches, keep Blueberry Hill and its extremely resourceful neighbors in mind. Especially Diane. She is a true, true gem. Not only did she lend her home and her costumes for the event, but she performed a completely heartfelt ceremony in front of some pretty ridiculous outfits, and did it with a lot of style.